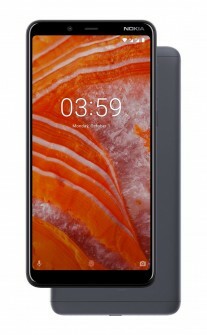 The new Nokia 3.1 Plus brings a roomy 6.0” screen to the entry-level Android One market. The Plus model offers dual camera photography, a fingerprint reader and, of course, a larger battery over its sibling, the Nokia 3.1. The screen has an 18:9 aspect ratio and keeps the resolution at 720 x 1,440px. So, it’s not the sharpest, but the screen is bigger than what the 6.1 Plus and 5.1 Plus have to offer. And, unlike those two, it doesn’t have a notch. The back houses a dual camera – the 13MP f/2.0 main module is joined by a 5MP depth sensor. It’s used for bokeh effects, naturally. There’s also a fingerprint reader below the dual cam, the first in HMD’s entry-level lineup. The selfie camera is a fixed-focus 8MP shooter. The Nokia 3.1 Plus is powered by a faster chipset, a MediaTek Helio P22. 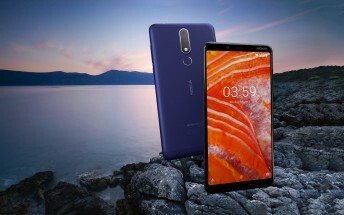 The all eight cores of the Cortex-A53 processor are clocked higher than the base Nokia 3.1 The RAM and storage capacities are the same, though – 2/16GB and 3/32GB. Three’s a microSD slot for up to 400GB more. Again, the phone runs Android One (currently Oreo, but should be updated to Pie before long). The phone’s chassis is built out of machined aluminum, combined with a die-cast metal interior for enhanced durability. The surface has a matte finish and is available in three colors: Blue, Baltic and White. The P22 is a 12nm chip, significantly more power efficient than the 28nm chip in the non-Plus model. 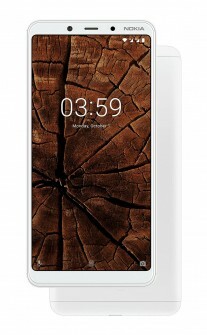 Combined with the larger battery, 3,500mAh, the Nokia 3.1 Plus promises 2-day battery life. A bit unfortunate that it uses a microUSB port. The Nokia 3.1 Plus will be available later today at INR 11,500 ($155/€135).